Sam Calagione is a wine guy. Oh, don’t let the fact that he owns one of the largest craft beer players in the game deceive you. He’s a wine guy. One only has to look at his DFH webpage to see that. Every beer brewed by DFH has a comparable wine listed, and the newest core beer added to the DFH line up, Sixty-One was created from Sam’s love of pouring a little red wine into his 60-minute IPA. Not to mention the other wine/beer combination I’ve covered this month. So it should be of no surprise to anyone that one of the things DFH loves to do is beer/wine hybrids and the wine/beer hybrid I want to focus on in this review is Noble Rot. Do wine and beer make good bed-fellows. Let’s Taste. 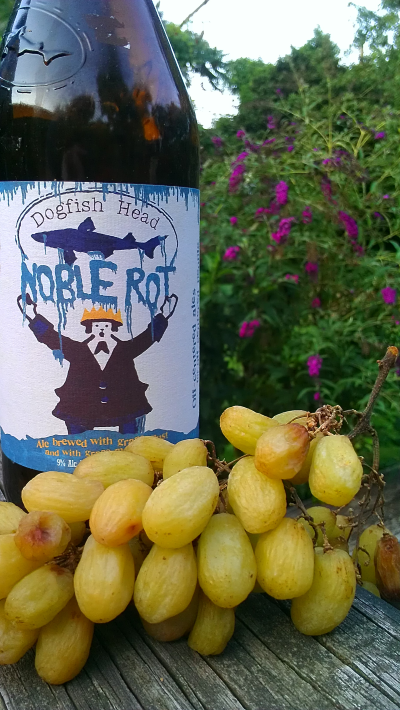 Noble Rot is build off of a grain bill of pils and wheat malts and fermented with a Belgian yeast strain. It contains 18IBUs and has an ABV of 9%. For those not in the wine know, Botrytis cinerea or noble rot is a fungus that grows on wine grapes that if controlled, is actually considered beneficial for well know wines such as Sauternes from France , and Beerenauslese or Trockenbeerenauslese from Germany. It is also an important factor in aszú from Hungary, Slovakia, Romanian Grasă de Cotnari, and Austrian Ausbruch. ME: Unsurprisingly, NR pours like a carbonated white wine. and visually could pass as an inexpensive champagne in the glass. The nose also wants to convince you that it’s a wine with a touch of earthiness against a back drop of grape. There’s little if any “beer” to be recognized here. The flavor is light with notes of grape, green apple and some grains, but there is that Belgian yeast “spice” to remind you that this is supposed to be a saison in style. The finish is wine-like as well with no hop bitterness from the beer or acidic bite from the wine. Really, if I blind folded a group of people so they couldn’t see NR some would probably think it’s an inexpensive white wine, not a beer/wine hybrid (which isn’t all that inexpensive). Is that good? I guess it depends on whether-or-not you feel beers should be beers and wines should be wines. Here’s where ratings hit another logical brick wall. I’d go GLASS on this as it probably would be a great beer to sip on a hot summers day, although probably not something you’d want to drink all day. I’d recommend TASTER however, because I think if you’re a beer lover, you really should know what you’re getting into before you plunk down a lot of money on it. It’s not a bad DRINK, but it might not be everyone’s glass of beer.